Applicants will be contacted if position is available & resume meets automotive employment requirements. Please fill out form completely, be sure all info is correct. Thank you for your interest. 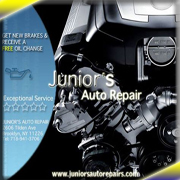 Thank you for taking the time to apply for employment with Junior's Auto Repairs. Please be sure to fill in all info & all entered information is correct. Have your resume ready to submit, exceptable formats are (jpg,jpeg,pdf,txt,doc,docx). Lable resume: Last Name,first name resume, No spaces. There is an option to paste a cover letter, certifications and extra applicable info.